Friends of the School of English are invited to support 2017's Songs & Words for a Home for All pop-up festival on Tuesday, December 12th. With performances from Glen Hansard, Frances Black, Emmet Kirwan, Sarah Clancy, among others, the event features some of Ireland's leading musicians, spoken word and performance artists, and is intended to raise awareness of the reality of the deepening housing and rental crisis for people across the country. 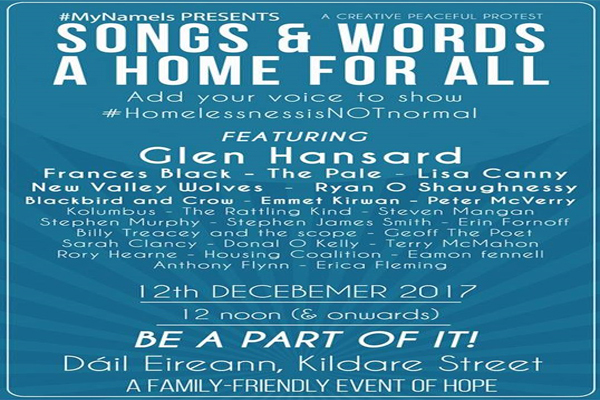 Co-hosted by the Inner City Helping Homeless and the #MyNameIs campaigns, this 'Sing-Out for Homelessness' is a family-friendly event, and all are welcome to attend. More details available here: https://www.facebook.com/events/1259388110832756. Congratulations to JF student Erica Fleming for her role in organising this "creative demonstration" for so important a cause.